With so many tents out there, and so many companies to choose from it can be hard to know which is the best tent brand. First you need to know what kind of camping you’re doing and the weather you’re likely to encounter, as well as how many people you plan on bringing. Click here to check out my favorite tent brand at Amazon. A good quality tent will last you for years, but don’t feel pressured to spend a fortune thinking it’s “the best”. Look for features you need above all. The first thing to look at is how big is the tent. All tents will have a designation specifying an approximate number of people who can sleep/fit inside. But, just because it says up to three adults will fit, it does not mean they will be comfortable. So keep this in mind when picking a tent. Many include a diagram suggesting how you should sleep inside and this will give you an idea of space. If you like more space or want to be able to keep gear inside opt for a tent that sleeps more people than you plan on having. It is a good rule to buy a tent with a capacity that is 2 higher than the number of people for comfort and gear storage inside. Don’t forget to check the height if you’ve got tall adults or if you expect to stand/sit up inside. If you’re backpacking you’ll need a tent that is light. Look at how the tent is held up. How many poles does it have? Similarly, if you’re driving does the tent fit into your car or camper safely? The weight and construction of the tent will also tell you how easy it is to put up. If you’re alone or a beginner you’ll need something simple. Tents are designated by seasons. You can buy a three or four season tent. A four season tent means it is suitable for use in all four seasons. It has extra insulation or heat reflection technology needed to prevent you from freezing to death outside in freezing temperatures. A three season tent does not have this and is often cheaper because of it. Aluminum poles are light and stronger than fiberglass. Fiberglass is lighter but fragile. You can, however, easily replace either at a camping store or buy a repair kit. A rainfly acts as a cover for the tent to keep it dry, rather like an umbrella. It needs to come down the sides of the tent as well as cover the top. Some also have a porch area where you can store gear. While most tents are water repellant they are not waterproof so you will need this if you expect poor weather. 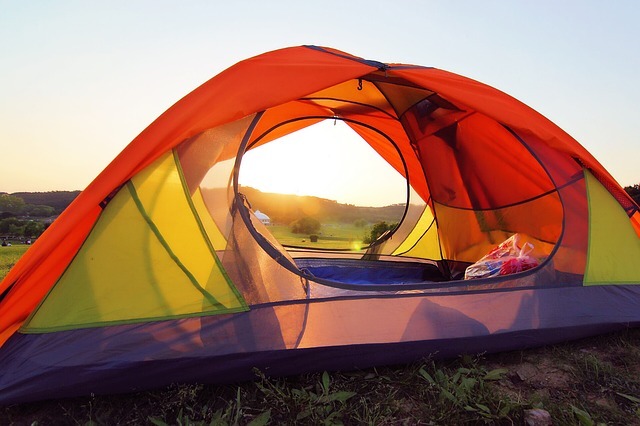 There are two types of tent – those with guy lines and those without. Guy lines are a loop sewn into the wall or rainfly which allows the material to be staked into the ground to stop it flapping. This will prevent it ripping in high wind and will also allow you to sleep in peace because this is very noisy. Noseeum meshing is your own personal bug net. It will prevent creepy crawlies from getting in through the windows and also gives some measure of privacy. Roof vents allow a cross breeze to come through the tent and help keep you cool by allowing air to circulate. This helps in cold weather as well because it stops condensation forming. Look for good quality zippers as these will get the most action on your tent – a cheap zipper will break quickly and you’ll be left without a door/window/rainfly. Some brands include a ground cloth. This is a footprint tarpaulin that is slightly bigger than the tent itself and will protect the bottom of the tent from wear and water. While it’s possible to sit your tent on a regular tarp but you’ll want to tuck the edges underneath your tent so that if it rains water doesn’t collect between the tarp and the tent. It can store your gear out of the way so that you have more space, and it also gives you somewhere to hang a lantern at night from the ceiling. Some tents have lantern hooks which make that redundant but it’s still extra storage. Almost all tents are made from Nylon. The thickness and durability of the fabric is measured in D or denier. The higher the D the more fibers in the fabric and the tougher it is. A low D rating means that the fabric is thin and may tear easily. Some companies will coat their fabrics with strengtheners, waterproofing agents, flame retardants etc. in addition to this rating. Probably the most recognized tent brand, they’re available everywhere. The company was founded in 1900 in Kingfisher Oklahoma and originally sold just gasoline camping lamps. The Coleman Lantern remains it’s most famous product. In the last 100 years they have expanded to cover every sort of camping gear including tents. In 2016 the company rebranded and now includes better aesthetic qualities and new technologies thanks to a new design team with the company’s same long relied on reputation which makes them good for regular campers. I love the color coded tent poles for easy setup. And this baby is made for even the worst weather conditions. Click here to check out the Coleman’s WeatherMaster tent at Amazon. Featuring 2 doors, it’s a little heavy at 31lb with a dome design that includes the waterproof WeatherTec system. It can sleep up to 10 people and has a top height of 80” so most people can stand up in it. This has a simple set up which is ideal for short trips and campgrounds. It has the best balance between instant and conventional pitch so it is still quick to set up. It has a rainfly, mesh roof, inverted seams and welded floors, color coded poles, and 8 guy lines. It is made of PU coated 75D Polyester taffeta. WeatherTec means great for bad weather. Color coded poles for easy, fast set up. While this is actually a Walmart brand, this should not be discourage buyers. It simply means that it’s budget friendly! The company is based in the Ozark Mountains of Arkansas which is why it was chosen as their product brand name. The banner covers footwear and a variety of outdoor equipment. While the quality is not high end, they are user friendly and ideal for family campers, first timers, and those who want a good tent on a budget. The Ozark tent is a great choice for first time campers or folks looking for a quality budget option. Click here to see the Ozark Family Cabin Tent at Amazon. This offers three doors including a similar hinged design to the Coleman, so that each room can be accessed separately allowing for privacy. There are six windows in addition for extra lighting all with noseeum mesh. The fly seams are taped and the room dividers can be removed to make this into one large space rather than three small. The tent weighs 31.4lb and is a dome style with a rain fly. It has 4 guy ropes and cines with a carrying bag. It also has a mesh roof, two organizer pockets inside each room, color coded stakes, and uses aluminum poles. Three external doors and room dividers for greater privacy. 6 windows for panoramic views. Noseeum mesh to keep bugs out and privacy. Taped fly seams for weatherproofing. Rainfly to keep the tent dry. The seams are taped not welded. A widely known brand in the outdoors community Kelty is based in Boulder Colorado and produces lightweight, high end tents that are less expensive than the true “high end designer” brands like Hilleberg. They tend to skip on extra features and instead opt for better quality materials which makes their products last longer. These tend to be the choice of the serious camper. They market themselves less as a camping brand and more as an adventure company and do a lot of conservation work as well. This Kelty tent has easy setup and break down features. And it’s got extra storage for your gear! Check out the Kelty 4 Person Tent at Amazon. This is a three season tent that is ideal for backpacking. It’s a freestanding design that has three poles for fast set up. It weighs only 10lb, 7oz and can sleep up to 4 but still has 2 doors. It has noseeum mesh walls for best ventilation and an 1800mm PU coated 68D polyester fly. There are two storage vestibules for gear and an Arc Edge so the floor seams are above the ground. The zippers are noiseless and there are vents built into the fly. The release buckles allow for easy break down and it has internal and external gear pockets/loops in the walls. There are corner and fly guy points and a carry sack. All of the seams are sealed for waterproofing and the ridge pole is shockcorded steel for strength. Coleman is clearly the best tent brand “all rounder” and having such a huge selection means they’re likely to have a tent to suit almost anyone’s needs. Their prices are reasonable, and with innovative features like hinged doors, and color coded poles it’s easy to see why they’ve been popular for 100 years. Planning to face the Appalachian Trail? You’re going to need a top of the range backpack. Many moons ago when I started my love of the outdoors, camping meant sleeping it rough. Thankfully things have changed! Now sleeping under the stars is just as comfortable as a bed at home! If you’re planning a weekend outdoors, getting ready for bad weather or rigging out your survival gear… A top of the line jacket is essential.